Jignasha Panchal and Philip West have received the 2014 Salters’ Institute Prize for Exceptional Achievement in Physical Sciences. Jignasha Panchal and Philip West are the recipients of the 2014 Salters' Institute Prize for Exceptional Achievement in Physical Sciences. 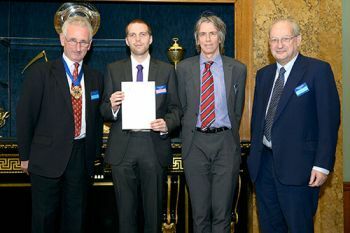 The annual prize is awarded to two of City's outstanding engineering or mathematics students in recognition of exceptional educational achievement. 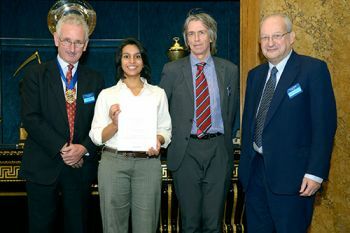 Jignasha, a final year (MEng Civil Engineering) student and Philip in his second year of the MEng Aeronautical Engineering programme, received their prizes during a ceremony held at Fishmonger's Hall on November 20th, which was attended by 200 guests. The awards were presented by Lord Sainsbury of Turville who also delivered the keynote address and presented awards at the ceremony. Professor Roger Crouch, Dean of the School of Mathematics, Computer Science and Engineering, attended the prize-giving ceremony. Taking its origins in medieval London's salt trade, The Salters' Company was first licensed in 1394. It is ranked ninth in order of precedence as one of the Great 12 Livery Companies of the City of London. It is a diverse organisation responsible for several charitable foundations and carries out significant philanthropic work in science education and fostering fellowship among its members. Please visit this weblink for more information on The Salters' Institute.